Precious metals futures declined on Friday and for the week. Silver marked its lowest close in 2018 and gold settled at its worst level in almost a year. Gold for August delivery shed $5.40, or 0.4%, to finish at $1,241.20 an ounce on the Comex division of the New York Mercantile Exchange. The settlement is the weakest since July 17, 2017, when prices ended at $1,233.70 an ounce. 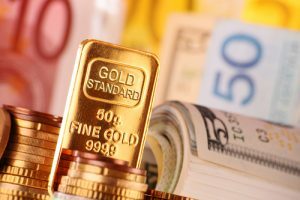 "The dollar has been a prime mover of gold prices…Market sentiments have been largely positive on the greenback as investors pivoted from the safe haven asset despite rising geopolitical risks," Reuters quoted Benjamin Lu, a commodities analyst at Singapore-based broker Phillip Futures, in a note. "Nineteen market professionals took part in the survey. There were 12 votes, or 63%, calling for gold prices to fall. There were four votes, or 21%, calling for gold to rise, while three voters, or 16%, look for a sideways market. Meanwhile, 642 voters responded in an online Main Street survey. A total of 280 respondents, or 44%, predicted that gold prices would be higher in a week. Another 263 voters, or 41%, said gold will fall, while 99, or 15%, see a sideways market." Elsewhere, silver for September delivery fell 16.2 cents, or 1%, to end at $15.815 an ounce. The closing price is the worst since Dec. 12 when silver’s settlement was $15.668 an ounce. Silver futures shed 1.6% this week, falling a combined 5.5 % in five straight weekly losses. The precious metal is 7.8% lower on the year so far. October platinum fell $16.10, or 1.9%, to $830.30 an ounce, for a 2.2% weekly loss. Palladium for September delivery lost $16, or 1.7%, to $932.80 an ounce, for a 1.6% weekly decline. The two are also lower on the year to date with losses of 11.5% for platinum and 12.1% for palladium. Gold declined $4.20, or 0.3%, to 1,241.70 an ounce. Silver shed 3 cents, or 0.2%, to $15.81 an ounce. Platinum lost $7, or 0.8%, to $831 an ounce. Palladium rose $6, or 0.6%, to $944 an ounce. In LBMA results for the week, the losses reached 1.1% for gold, 1.2% for silver, 0.8% for platinum, and 0.3% for palladium. Gold bullion coins rose by 11,500 ounces this week after they advanced by 12,500 ounces last week. Splits included 6,000 ounces in American Gold Eagles against 5,500 ounces previously and 5,500 ounces in American Gold Buffalos compared to 5,500 ounces previously. Silver bullion coins moved up by 290,000 this week after rising by 75,000 last week. For a second week in a row sales came entirely from American Silver Eagles.